We can help you through the sometimes overwhelming selection of custom framing to suit your style and budget. 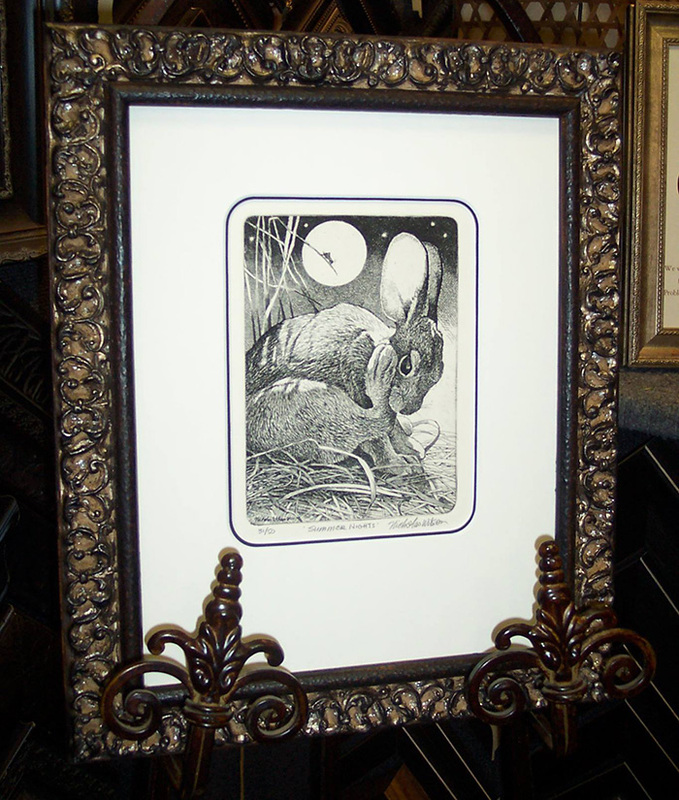 We offer full service custom framing through the stages of design, matting, mounting, glazing, and final assembly. We are your framing solutions experts! 1. Where will your framed piece hang? 2. How large or small does the piece need to be for the area selected? 3. What color is the surrounding wall or wallpaper, drapes, and furnishings? 4. Is your room contemporary or traditional, or something in between? Taking a few minutes to think about the above considerations will help us to help you. Bring in paint chips, fabric samples, or other colors that will be in the same environment as your framed piece so that we can create a finished piece that will attract attention. Matting enhances, protects, and preserves your artwork. Archival or Conservation mats are made of puripad cellulose and are lignin and acid free. There is nothing acidic that would lead to deterioration of your artwork. We highly recommend the use of conservation boards on pieces that you want to protect and preserve. If you are matting a xerox copy, magazine article, or an inexpensive print, then regular mat board is perfectly acceptable and much more cost effective. We employ a variety of methods for mounting your pieces depending on the type and value of the artwork or photograph. Original artwork, water colors, oils, pastels, lithographs, limited edition prints, and any valuable photographs are mounted with archival methods. This method can be reversed if needed with no damage to the piece. Posters and less valuable pieces are dry mounted (glued with heat) to a foam board. Shadow boxes use many different techniques from sewing to counter sinking in the mat. Glazing is the finish on the glass that covers and protects your finished piece. There are several choices of glass finishes from regular to museum glass. Regular glazing creates no distortion or glare and is inexpensive and easy to clean. Conservation Clear creates no distortion or glare and blocks 97% of UV light. It is very reasonably priced. Reflection Control glass has a slight distortion and glare. It is reasonably priced and easy to clean. Conservation Reflection Control glass has a slight distortion and glare. It blocks 97% of UV light, is semi-expensive and must be cleaned with a mild cleaner. Museum Glass is the highest quality. It has amazing clarity with no distortion or reflection. It blocks 97% of UV light and requires a mild cleaner. This high quality glass costs more, but is truly the best of the best. All framing is done in our shop. We assemble your frame, cut the mats and glass, mount and place the backing on your piece. We carefully seal and finish the frame with a dust cover on the back and install appropriate hardware for hanging. When you pick it up, it is ready to hang.